New Forest Brushes: We live and learn! I have always preferred to be open with people in all my professional and business dealings. And to be prepared to admit mistakes. I made my decision to go ahead with my brushes having tested samples of a fan shaped brush. When confirming my order, I asked my manufacturer to produce a slightly flatter fan shaped head. I assumed the backbone of such a brush would be similar and since my manufacturer didn't advise me to test a sample of the new shape, assumed all would be well. The difference in shape may be small, but it has completely altered the backbone of the brushes. I should have asked for a sample of the new brush shape to test myself. My manufacturer should have advised me to do this as well. So we have both messed up. And I have told him so. This photo shows the difference after use between the flatter fan shaped brushes I have received and the more rounded fan shape I had tested myself. So where do I go from here? There is no doubt that the High Mountain hair is wonderfully soft, but it must be made in a shape, loft and density that will suit the modern shaving enthusiast who wants a versatile brush with adequate backbone to be a pleasure to use in a variety of ways. And I will also test a bulb shape version. So that's how things stand for now. Meanwhile, I have some lovely brushes that will suit people who do not share the enthusiasm for today's stiffer brushes. 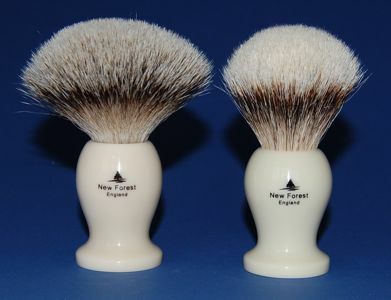 I would describe the brushes as somewhere between an Edwin Jagger Silvertip, Edwin Jagger Super and a Kent BK4. These are all what I would describe as soft, floppy brushes.Others may more kindly call them more flexible. Take your pick. They obviously have a following. I'll use my brush for a few days before deciding what to do. I may get to like it! At least I will learn the best way to use it. Sorry your new brush's didn't meet your expectations. How soft and floppy are they? Will they make good cream brush's? If so, I might still want one for my collection. Let use know what you think after a couple of days. I thank you for your efforts to bring us reasonable priced quality brush's. A noble deed. Thanks for the question. It enables me to explain more fully. You can see from the photo above how the brushes I have will bloom more than I intended. The one on the right is a well used sample with a slightly more rounded fan shape. The new brushes are similar to the backbone of the brushes supplied by Edwin Jagger and Kent BK4. They are better suited to creams than soaps. I have used the High Mountain brush three time now with creams. It lathers profusely and releases it wonderfully well. Painting the lather on is a luxurious experience. Lathering in circular motions makes the hairs splay out more than I would like but it still works effectively and reveals the exeptional softness of the tips. I will offer the brushes for sale soon, at a lower price than I intended, but I will emphasise that the brush is better suited for use with creams. Who knows, I may well find that many people welcome a less stiff brush! I will post further information on this blog when I decide how to proceed. I like/prefer fan-shaped brushes. I have a brush a friend put together for me that bloomed exactly like that. It is my favorite brush. So... If you have any left, I would love to purchase one. Let me know if you have any left, and how I could buy one, when you get time. The nearest to it would be the New Forest High Mountain Badger 2224 listed now at the beginning of this site. It doesn't bloom as much as the one above but it is magnificently soft and luxurious on your face. There is nothing wrong with a good cream brush as use a lot of very soft soaps and creams. So let me know when you decide what to do. I have a few brushes and use them for different moods/days/products so a couple more will not hurt. Thanks Steve,you are of course quite right! I'm young and have very little money, so I'd be very interested in a good brush sold for a lower price than usual, and I'd certainly be willing do adapt my technique and to start using creams.